By Karen Le Roux, based on an interview by Janet Jobson. “To develop and sustain sound, values driven leadership across the African continent, it is essential to inspire and shape successful leaders in the mould of Gandhi, Mandela, Martin Luther King and Mother Theresa, all leaders of incomparable significance,” asserts Rhodes Scholar, Africa Leadership Initiative Fellow and member of the board of trustees at the Aspen Institute, Isaac Shongwe. The overriding objective of the Africa Leadership Initiative (ALI), an integral part of the Aspen Global Leadership Network, is to harness the untapped talent of emerging leaders in business, government and civil society and to steer it into more conscious deeds and services. A case in point, according to Shongwe, is the resourceful and energetic work conducted by leadership development guru, ALI Fellow and CEO of the African Leadership Academy, Fred Swaniker. Shongwe is extremely enthused by Swaniker’s achievements. “Fred has successfully raised money for his cause. It is incredible. He was at global management consulting firm, McKinsey & Company. He could have merrily stayed at McKinsey, become a partner, and earned good money through being a thought leader. “What Fred has done, in collaboration with other people, is significant. We need more people to step up and make a significant contribution. ALI’s objective is to attract leaders who are community spirited, values based, and with thoughts that lead into action in their quest to help others. It is about social upliftment. If we can live in a world with this mindset and culture…. Wow!” exclaims Shongwe with passion. With regards to playing soccer, I was the one, again, who organised matches and ended up captaining the soccer team.” This early exhibition of leadership under trying circumstances laid the groundwork for what would become Shongwe’s leadership style, that of participative leadership. His next big leap was supported by unlikely mentors from across the Atlantic, mentors who taught him the immeasurable value of role models, networks and mentorships. While at a suburban farm school, Shongwe’s natural charisma and attributes caught the eye of Englishman, John Holehouse, a facilitator of an outreach programme. The end result was O and A Levels at a school in England, where he was elected head prefect and captain of the soccer team. “When I finished A Levels I applied to universities in the UK. I was always fascinated by America and wanted to go to the US. John was at the International School in Tanzania, and by chance, there was a professor from Wesleyan University who was on sabbatical at the same school. “I applied to the Liberal Arts Colleges and Wesleyan asked one of their trustees in London, Steven Pfeiffer, to interview me. Steve changed my life. “Steve was an American Rhodes Scholar in 1969. When he interviewed me, he must have seen something in me that made him recommend me to Wesleyan. That’s how I ended up going to Wesleyan,” recounts Shongwe. “During the time I was at Wesleyan, when Steve came into town for board meetings, he would visit me. He is a lawyer of one of the big law firms in Washington, DC. He is a very strong athlete, very strong academically and has a very strong social fibre. I was honoured when Steve started talking to colleagues about me. Soon thereafter, Steve became my mentor and had a huge impact on me. “If it were not for Steve’s persistence, I would never have applied for a Rhodes Scholarship. I was the second black Rhodes Scholar after Professor Loyiso Nongxa, incumbent vice-chancellor and principal of the University of the Witwatersrand. “Now I sit with Steve on the board of Barloworld. This is why I believe that the mentoring and role model concepts are very important,” Shongwe explains. 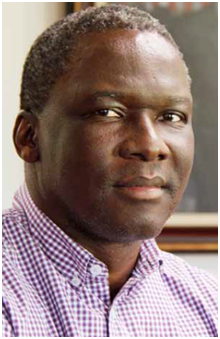 An invitation to participate in the Aspen Institute’s Henry Crown Fellowship Programme in 2001 accelerated Shongwe’s advancement to that of a specialist in leadership development. “I was so blown away by the programme. I said, ‘I need to take this back to South Africa.’ I came back here and ran a pilot. I selected twenty people who are my friends, and I managed to convince Aspen to send someone to South Africa to pilot the programme, to see if it would work in our environment.” Notwithstanding his demanding day job as Senior Executive of the Barloworld Group, a job that entails taking responsibility for Strategy, Innovation, People and Sustainability across the Barloworld businesses, Shongwe was inspired to create the Africa Leadership Initiative South Africa, a highly effective think tank with counterparts in West Africa and East Africa. “In 2003 I launched my first class. We currently have seven classes with one hundred and thirty two Fellows. I choose people – sixty percent from business, twenty percent from civil society and twenty percent from government and provide them with a platform for dialogue and debates centred around deliberately selected readings spanning three hundred years. They go through a journey together that inspires them to move from success to significance,” explains Shongwe. Shongwe is firmly of the belief that it is the same set of values and experiences, gleaned from leadership interventions and initiatives, which connect emerging and established leaders. “We have read the same readings. We have analysed the same issues. We have gone through the same process. That gives us a common platform to create a sense of shared values around issues that are difficult, but need to be addressed. ALI attempts to focus on developing leaders with community-based values. “If that person ends up being the president of South Africa one day, we will be proud, because that person will not be driven by a value system that is not good for society. “He or she will be driven by real motive. It is hard. We were all excited when Obama became president. It was an amazing story. But once Obama was in office, he made a critical decision about the Iraqi prison camp that some of his supporters did not approve of. “Across the continent now we have about three hundred Fellows. Through the Aspen Institute, we have similar programmes in the US, Central America, India and the Middle East, thus spreading the influence to Fellows in forty four countries. “Every two years we have a three-to-four day get together at Aspen in Colorado. We go there and discuss issues such as poverty, globalisation and so on. It is life changing for people,” confirms Shongwe. Comprising four seminars – The Challenge of Leadership, The Aspen Seminar, Leading in an Era of Globalisation, and The Promise of Leadership – the Africa Leadership Initiative is about creating a community and then developing the same values system and culture where each Fellow holds each other accountable. “If I or any member of the Fellowship behaved in a way that is not in line with our values, other Fellows would say, ‘Isaac, what has happened to you? We do not behave in this manner.’ I would be embarrassed. Even if you have aspirations, how much land does a man need?” asks Shongwe wryly. Stunning article. I have known Isaac since he was a Rhodes scholar doing vac work at Barlow Rand – and ironically I now report to him. He and many of the other ALI fellows are an inspiration. Brilliant and inspiring! Alexandra youth need you to come and inspire them. Visit our Vincent Tshabalala Education Trust beneficiaries and saturday school tutors when you have time.